WASHINGTON — Sam Yoon, executive director of the Council of Korean Americans, issued the following statement on Nov. 17. Yesterday, President Barack Obama announced this year’s recipients of the Presidential Medal of Freedom. While the late Col. Young Oak Kim was not selected for the award, we want to thank each and every one of you for supporting our effort to nominate him. Many of you called your elected officials, friends, and colleagues encouraging them to take a stance. Because of you, we built an extraordinary coalition of U.S. senators, congressmembers, state and local officials, current and former diplomats, military officials, civic organizations and educational institutions that united in support of Col. Kim’s nomination for the Presidential Medal of Freedom. If selected, Col. Kim would have been the first Korean American ever to receive our nation’s highest civilian award. Although we did not achieve our ultimate goal, we should be proud of what we accomplished and not be discouraged. In the past year, CKA has been at the forefront in educating our elected officials and the public about Col. Kim’s life and what it means in today’s context. Col. Kim was the first Asian American in the history of the United States Army to command a battalion in combat. 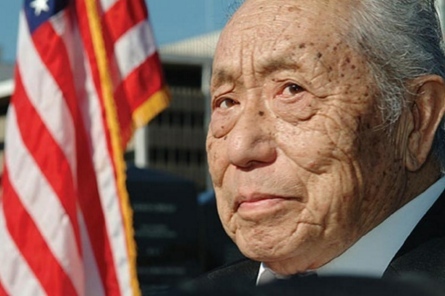 He proudly led the famed all-Japanese American 100th Infantry Battalion/442nd Regimental Combat Team during World War II and volunteered to serve in the Korean War, where he fought with distinction. For his military service, Col. Kim earned an unprecedented number of awards: Distinguished Service Cross, two Silver Stars, two Bronze Stars, three Purple Hearts, two Legions of Merit, Italy’s Bronze Medal of Military Valor and Military Valor Cross, France’s la Legion D’Honneur, and the Republic of Korea’s Moran Order of Military Merit. Today, when the racial divide remains an explosive force in too many corners of the United States, all of us would do well to heed Col. Kim’s prescient words. We are stronger when we work together, rather than vilify those who are different. Indeed, America’s diversity is our greatest strength, which should be celebrated and respected. Upon retiring from the Army, Col. Kim selflessly and without fanfare devoted his personal resources toward serving the underprivileged and the marginalized throughout Los Angeles. He was instrumental in building up numerous nonprofit organizations throughout L.A. to help inner-city youth, the elderly, and minority communities. We especially want to thank the Congressional Asian Pacific American Caucus (CAPAC), led by Chairwoman Judy Chu, for their leadership throughout this process, and the office of Congressman Charles Rangel, who as a fellow Korean War veteran, championed Col. Kim for many years. We also thank President Obama for his consideration of our nomination. CKA will continue to celebrate Korean Americans who represent the best of our society. Let’s keep moving forward.